This car has had a comprehensive restoration done by Classic Showcase to a show driver level. During the restoration process, the body was stripped to bare metal, the metal finished and fitted, and repainted in its original color, and color sanded and buffed to a spectacular finish. A complete, new interior was installed by Classic Showcase's master upholsterers, including seats, panels, carpeting, a convertible top, new windshield and door glass. The instruments were fully restored, and a new wood dash veneer was installed and finished. The engine, transmission, rear end, brake system, suspension were rebuilt by Classic Showcase master technicians. New bumpers were added to the front and rear, along with new trim and re-chroming, new rubber seals, a new set of tires, battery, and exhaust system. This car is a spectacular example, and ready to be driven, shown, and enjoyed by serious Triumph collectors and enthusiasts alike! The Triumph TR6 was introduced in 1969 as a replacement for the TR5/TR250. The TR6 featured similar running gear components and chassis as its predecessor but incorporated new external styling. The updated styling, courtesy of Karmann of Germany, allowed for more cargo capacity in the rear of the vehicle when compared with previous models. The doors and the center section remained unchanged from the TR4 and TR5 models. 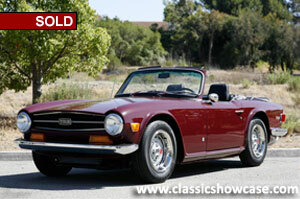 The interior comfort and drivability of the TR6 made it a highly successful British sports car. It was similar to the TR4 and TR5 with quality trim and a walnut dash. The TR6 was fitted with a 2498 cc, six-cylinder, inline engine. The European fuel-injected version of the engine was capable of producing around 150 horsepower, while the US carbureted variant produced 104 horsepower. The TR6 used a synchromesh, four-speed gearbox and was fitted with overdrive that worked on third and fourth gear.